Summer finally may be losing its hold on the Northern Hemisphere, but those of us reluctant to relinquish the (perhaps virtual) excitement of conducting summer field work in the Arctic may visit greenlandsfrozencoast.com. There, you can keep tabs on an international team engaged in a high-seas adventure aboard the ice-strengthened British research vessel, the James Clark Ross. 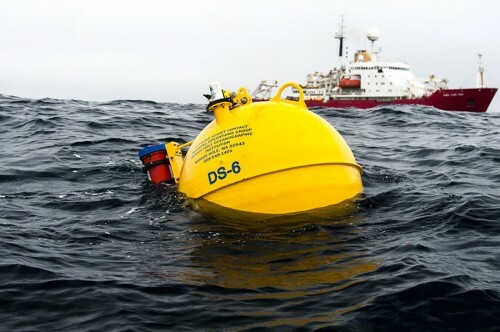 Scientists returned to the Denmark Strait off the eastern coast of Greenland in August to retrieve instruments on 12 moorings they anchored to the sea floor a year ago. They also are collecting information during over-the-side casts of CTDs, which are ongoing. The instruments collect water current velocity, temperature, and salinity information, all aimed at helping scientists better understand the East Greenland Current and its neighbor current, the recently identified North Icelandic Jet. As Dallas Murphy explains, the team is studying how the currents "contribute to ocean circulation patterns--and how circulation might be impacted by changing temperatures." Browse the website's short videos, photos, and stories, created by an outreach team of five. These materials explain, writes Murphy, "how our onboard scientists measure an ocean, the specialized tools required to do so, including the ship, the people who operate her, and the technicians who actually put the instruments in the water and (in most instances) retrieve them." In other words, visitors get to look over the shoulders of the science team as they do their work, linger on the bridge with the congenial JCR captain and crew, and gape at icebergs, fog-shrouded coastlines, and polar bears along with everyone else as they pass near the ship. Robert Pickart (Woods Hole Oceanographic Institution), is the U.S. National Science Foundation-funded chief scientist on the cruise. Colleagues from Iceland (including Héðinn Valdimarsson and Steingrímur Jónsson, who first identified the North Icelandic Jet), Norway, the Netherlands and Germany round out the team, providing critical expertise to what is really a huge undertaking: describing where all that water comes from and where it all goes. Great team, big science, really enjoyable and informative website.